JNN 26 Dec 2013 Moscow: Mikhail Kalashnikov, designer of the famed Russian AK-47 assault rifle, died on Monday in his home city of Izhevsk, an industrial town 1,300 km east of Moscow, local media reported. “We received sad news today … Kalashnikov died at the age of 94 after a prolonged illness,” Viktor Chulkov, press secretary of the president of Russia’s Udmurt Republic, was quoted as saying. In mid-November, Kalashnikov was admitted to an intensive care unit in Izhevsk, capital of the Udmurt Republic, in serious but stable condition. In June, Kalashnikov reportedly underwent a surgery in Moscow to have a pacemaker implanted. AK-47, now believed to be in use in more than 100 countries, has been listed among the “outstanding inventions” of the 20th century. The spokesman did not give the cause of death. State media reported that Kalashnikov was fitted with an electric heartbeat stimulator at a Moscow hospital in June and had been in hospital in Izhevsk since Mid-November. Kalashnikov was in his 20s when he created the AK-47 just after World War Two. The AK-47, which rarely jams even in adverse conditions, went into service in the Soviet armed forces in 1949. Today, Kalashnikov rifles are still a mainstay of Russia’s armed forces and police. Kalashnikov, a son of Siberian peasants, said pride in his iconic invention was mixed with the pain of seeing it used by criminals and child soldiers. 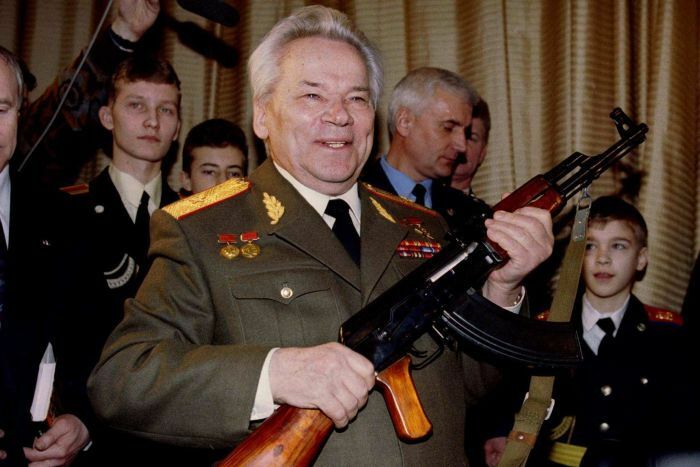 Kalashnikov said during a visit to Germany in 2002 that he was proud of his invention, but also saddened to know that the AK-47 rifles were widely used by terrorists. Kalashnikov died just a few hours after Kalashnikov Concern, an enterprise named after him, announced that the company was going to modernize its well-known AK assault rifle and increase its export. “We are currently conducting a large number of research and development projects. We hope to begin a modernization of the AK- 74 for the Defense Ministry,” RIA Novosti news agency quoted the company’s director Konstantin Busygin as saying. Kalashnikov Concern, employing 4,600 workers, was created this year through the acquisition of several other defense enterprises. This entry was posted in Europe and tagged AK-47, AK-47 assault rifle, Germany, Izhevsk, Kalashnikov, Kalashnikov Concern, Kalashnikov rifles, Mikhail Kalashnikov, Moscow, Russia, Udmurt Republic, Udmurtia. Bookmark the permalink. THE MAN INVENTOR OF THE MOST LETHAL AND DANGEROUS GUN IS NO MORE BUT HIS EVIL INVENTION SHALL CONTINUE TO KILL AND DESTROY ALLAH’S CREATION . MAY ALLAH NEVER NEVER CREATE ANOTHER SUCH INVENTOR AND TORMENT HIM TO SUFFER AS MUCH PAIN EACH INDIVIDUAL HAS SUFFERED BY HIS FIND, THE AK47 . .